Peanut butter rice krispie treats for two. It was like a slap in the face as a parent. My kid actually thought a rice crispy treat was an unsalted rice cake/ hockey puck spread with all-natural sugar-free peanut butter infused with flax seed. Someone lock me up. I’m clearly an unfit parent, and am ruining this kid’s life. Sooooo, I pulled out the marshmallows and began to make her a small batch of rice krispie treats. But, being the mother that I am, I had to include some kind of healthy thing in there. It’s just who I am. So, I plopped in some peanut butter. For protein, you know? I don’t know why I never thought of this before, but DANG, peanut butter in rice krispies treats is incredible. Camille tasted her first real rice crispy treat, and now I know she’ll never go back to the other version. It’s okay, childhood is for marshmallows and nutritionally devoid cereal, right? If you’re new around here, I make small batch desserts (did you know this?). 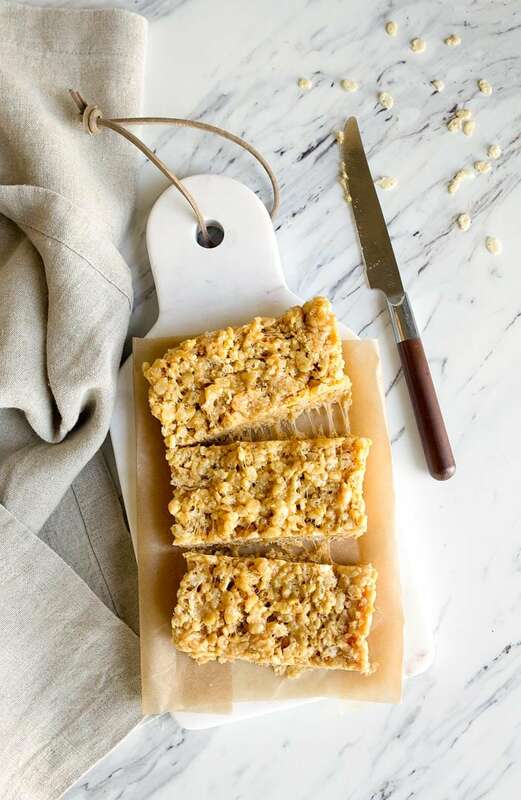 I made these peanut butter rice krispie treats in a 9″ bread loaf pan, You can slice them into 3 thick bars or 4 pieces, either way, and you still don’t have an entire tray of them on your counter tempting you. Leftover desserts are the worst, aren’t they? I can’t resist leftover cookies or rice krispie treats for breakfast, so this is the only way I can live my life (and fit in my pants). Camille wanted me to let you know that sprinkles on top are very welcome! But also: don’t miss the chocolate version! –> Chocolate Rice Krispie Treats! 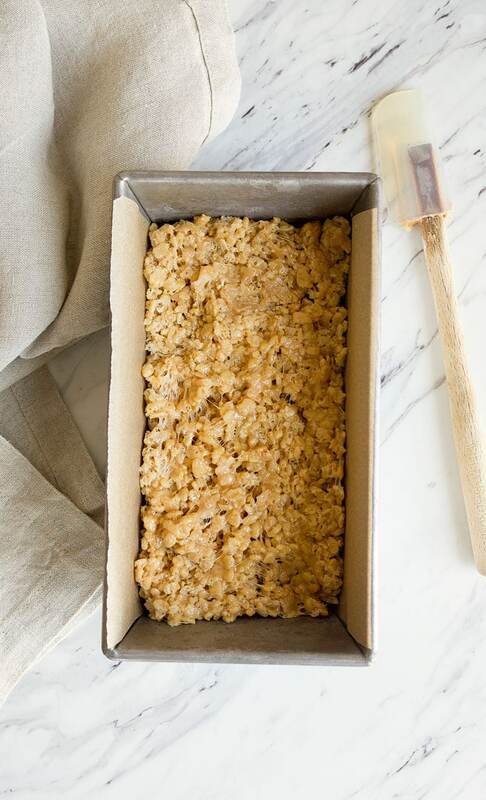 Peanut butter rice krispie treats for two in a bread loaf pan. First, line an 8 or 9" bread loaf pan with parchment paper in one direction, and spray all sides with cooking spray. Set aside. In a 2 quart sauce pan, melt the butter, peanut butter and marshmallows over medium heat until melted and smooth, stirring frequently. 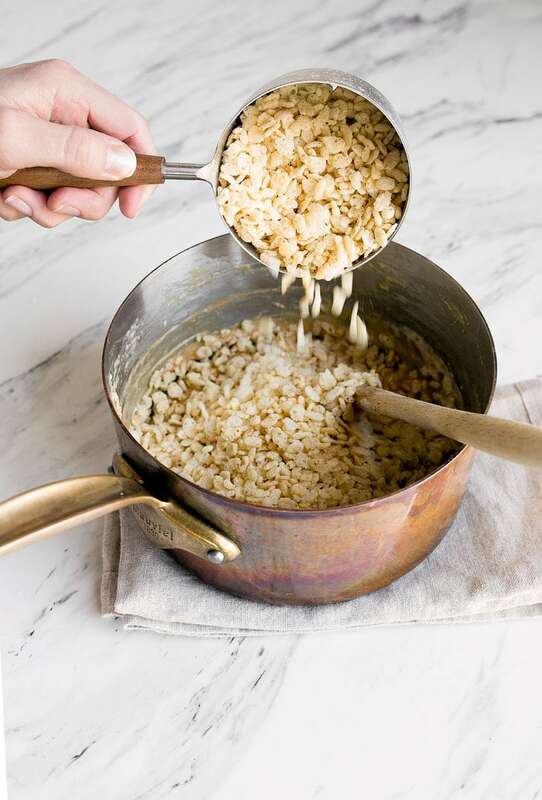 Remove the pan from the heat, and stir in the rice krispies cereal. Mix very well! Press the mixture into the prepared pan, and let cool for an hour to set. To be fair, nothing says love like sprinkles PERIOD. Looks yummy! I hope these made up for the fact she slept through choosing ballet slippers! My daughter has braces so I have not been able to make these….because the temptation would be too strong for her. I actually was craving a treat and bought one…..these would and will be soooo much better. I will only have a small batch that i’d have to hide from her. ???????? Scotcheroos aren’t generally made with marshmallows though. Sugar, peanut butter, corn syrup, boiled together (the epitome of healthy, of course.) Mixed with the cereal and then topped with a half/half mix of chocolate and butterscotch chips. Anybody who didn’t grow up with these is always so sad when I introduce them to the deliciousness … “where has this been all my life??”. Luckily with the advent of the internet, it’s slowly becoming less of a regional treat and becoming more universal. Ooh sweet! The work has been done for me. Because you’re amazing like that. Must make soon! And having it be a Midwestern thing, I’m not sure. I know when I left the Midwest nobody had ever heard of them. And now I live in North Carolina and zero people knew what they were (they have all been converted into Scotcheroo Lovers now, of course.) i wonder where exactly they did originate? I made these today and they were perfect! I added a healthy does of sea salt and mini chocolate chips (so they didn’t melt, I poured the mallow-pb-cereal mixture into a bowl until it cooled slightly – then I mixed in cold chocolate chips, and pressed it into the loaf pan). I cut them into about 20 (roughly) 1-inch squares – I’m planning on bagging them up for friends, but may need to make another batch so I have enough! 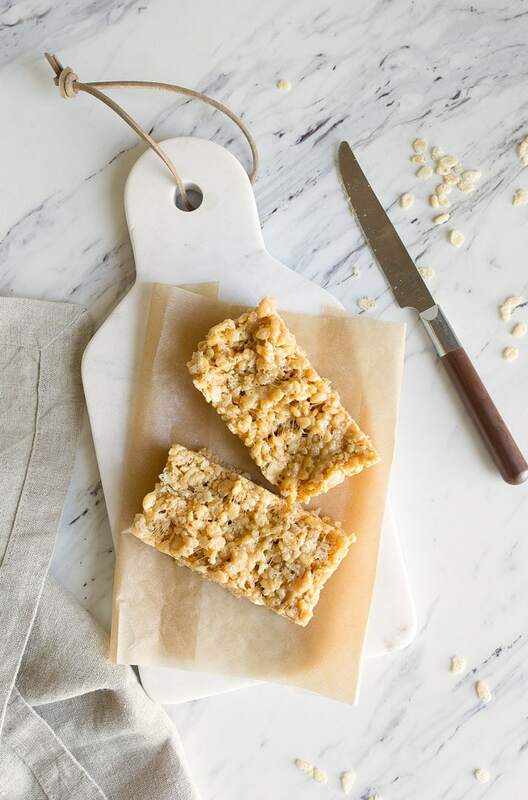 The little squares are so gooey and peanutty…I can’t stop eating them! lol stop you’re the best mom ever hahaa. 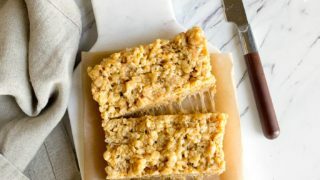 And seriously I love the idea of putting pb in rice krispie treats HOW have I never done that, either??! I seriously need to, these look amazing! I haven’t used them, but I’ve seen them! Do they melt easily? Just made these today…they are wonderful! I topped them with some mini chocolate chips and m&m’s. They really are ‘dangerously’ yummy. Have also made your chocolate rice krispie treats (for V-day, I topped them with some sprinkles…I think Camille would approve?) and that is awesome as well. Can’t decide which we like more! Thanks as always for your wonderful recipes, Christina! You have taken me back 50 yrs! My mom used to make a thin layer in a larger pan, cut it into two equal sheets. Then she spread softened vanilla ice cream on one krispie layer, topped it with the other krispie layer and refroze it. She cut it into ice cream sandwich bars to serve. My favorite!! Thank you so much for posting small-sized desserts! I live alone and I love to make sweets, but it’s tough some time to scale a recipe down to 1/3 or 1/4 of it’s original size and nobody needs a casserole-sized dish of baked goods sitting around to be gobbled down alone! These were fabulous. I went a little heavy on the peanut butter measurement and also added a sprinkle of salt and a dash off pure vanilla extract. Next time (and there WILL be a next time) I may throw in a handful of milk chocolate chips. Haven’t made rice krispie squares in years but I will try these! Regards, Jacklyn.